"I would like to present realization of my project on your web site. The project is about interior reconstruction of Club Rock Café, Prague. 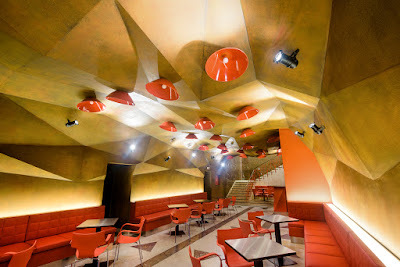 This music club includes theatre hall, gallery, music hall, pub and is located in the centre of Prague at Národní street. Project was realized during this summer and official opening took place at the beginning of September. I work as an architect/designer in a studio Scenografie, Prague. Assignment was to restore the function of foyer with new chillout zone and to connect upper floor of gallery staircase nad music hall in downstairs. Whole project was made in Rhinoceros 5.0. We make all parts of our work in Rhino from studies, visualization to production drawings for our manufacture. In this project it was same procedure as well. I used also Grasshopper for designing the shape and also for fabrication preparing."